Abstract: The handheld cell phone was introduced 42 years ago but the modern smart phone is less than 10 years old. Marty Cooper maintains that, although the phone contains amazing semiconductor and other technologies, the phone itself is still in its infancy. Personal wireless connectivity has the potential to revolutionize health care and education; the health care revolution has already begun. But the biggest contribution pf wireless with be in improving the very concept of collaboration. Marty points out the irony that the ability to solve the many problems associated with these revolutions may well be enhanced by collaborative tools that use wireless technology to improve itself. 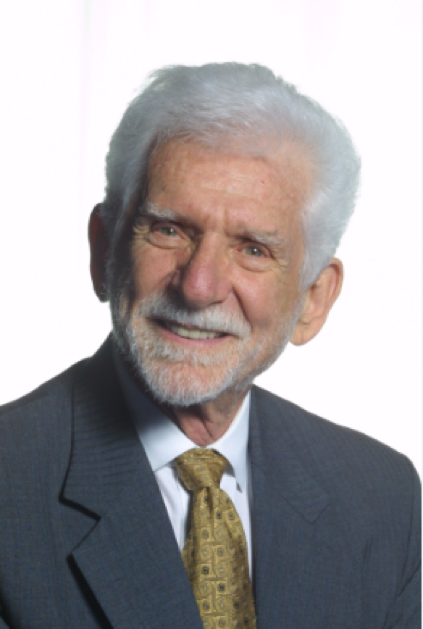 About the Speaker: The “father of the cellular phone,” Martin Cooper conceived, and led the effort to develop, a personal, portable cellular radio handset. The result was the introduction of the first truly mobile telephone in 1973. Cooper also formulated the Law of Spectral Efficiency (Cooper's Law), which states that the maximum number of voice conversations or equivalent data transactions that can be conducted in all of the useful radio spectrum has doubled every 30 months since Marconi’s first commercial transmissions . He has been involved in wireless communications since 1954 and has contributed to most of the systems advances in personal communications during that time. He is widely published on wireless communications, health care, technological innovation, the Internet, and R&D management. Cooper is a member of the National Academy of Engineering and a recipient of the NAE’s Draper Award. He is an IEEE Life Fellow, former president of the VTS, and recipient of the IEEE Centennial Medal. He has received numerous awards, including the 2009 Prince of Asturias Award for Technical and Scientific Research. He is a member of the FCC Technology Advisory Council and the Department of Commerce Spectrum Advisory Committee. He has bachelors and master’s degrees from the Illinois Institute of Technology, which also awarded him an honorary doctorate. He has served on the boards of several public and private companies.